I haven’t posted a new POW (Problem Of [the] Week) in quite a while, possibly a couple of months. I’m well into my 2nd semester of grad school here at Appalachian State University in lovely Boone NC and I’ve been pretty swamped with assignments. 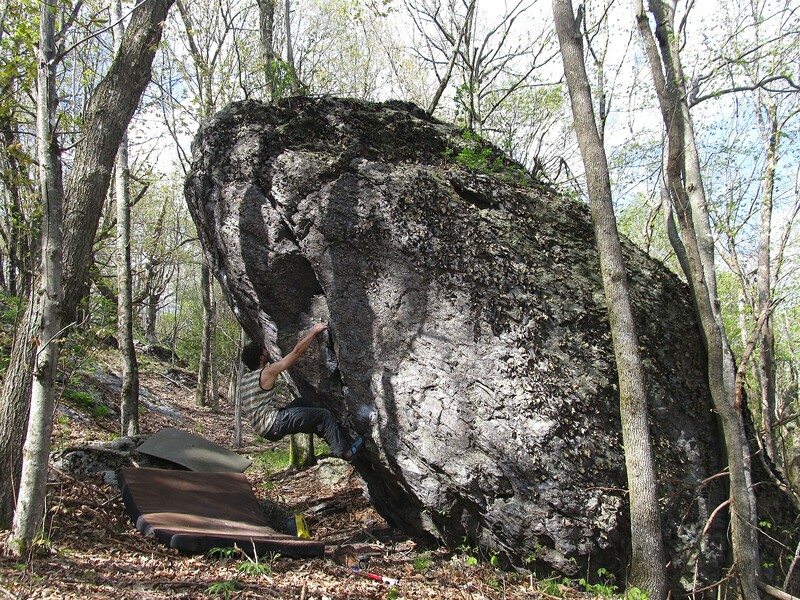 I figure a great way to make up for the lack of posts is by listing a brand new boulder in a new location (for bouldering anyway) in GHSP, and the 3 awesome new problems found there. 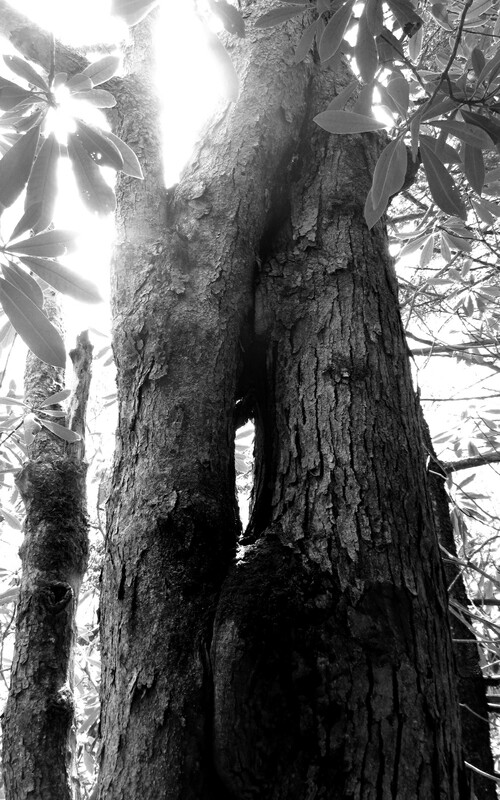 Early on during my summer spent living in GHSP (this past summer) I guided a nature hike along the Cabin Creek Trail. On the loop out from the creek and waterfalls below I noticed a craggy spot higher off the trail and a clearing. I ran back after the hike to investigate. I found several smaller, blocks that I wasn’t very psyched about, and then further on a big, steep, proud block. On the face of the block was a huge, intricate spider web and a colorful, fat, feisty Orb Weaver spider that seemed indifferent to my flailing as I climbed past. The rear (slope facing), steep, tall, main face is incredible and the taller of the two sides has a fun, easy, juggy, vertical to arching warm-up crack. The rock type is the same as the Highlands Area, only this boulder has been more sheltered from the weather over the years. This boulder is coarser than most of what is in the Highlands. The opposite side needs some cleaning and may reveal another easy line or two. 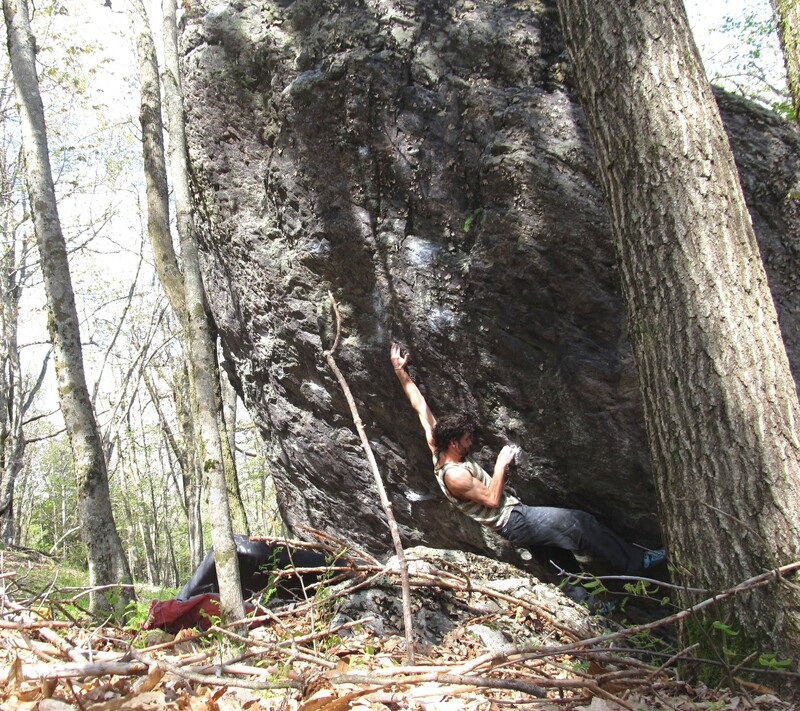 Further around from this may be a one/two move wonder to a tall and easy slab/scramble… Other than these possible climbs still in the rough, I FAd three great ones; Black Widow, Orb Weaver, and Recluse. 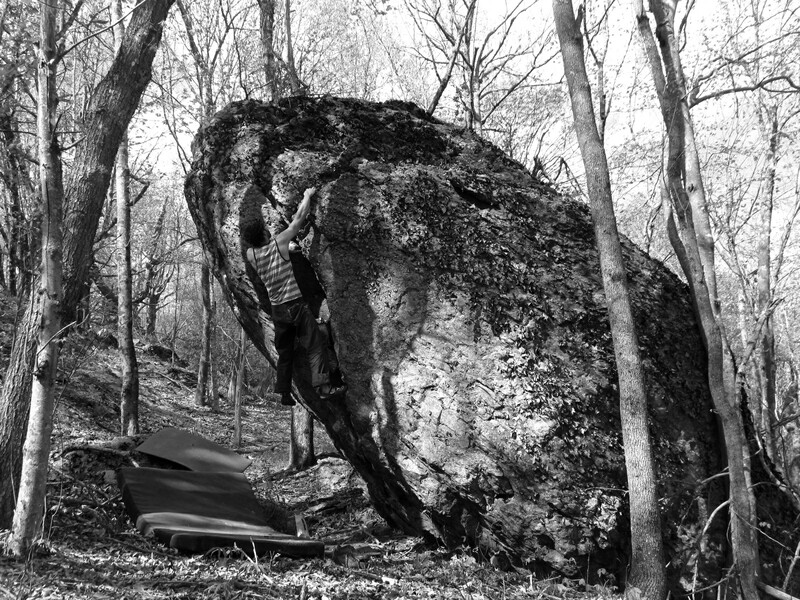 Recluse (V0/1): There is only one large crack on the boulder to the right of the the arête. This line begins on a large side-pull jug. Toss up to the huge crack, and you climb up until the crack trends left. Follow the jugs or massive knob/bulges to the easy top. This line is easily protected with a single pad. The landing is level, and the holds throughout range from big to huge. 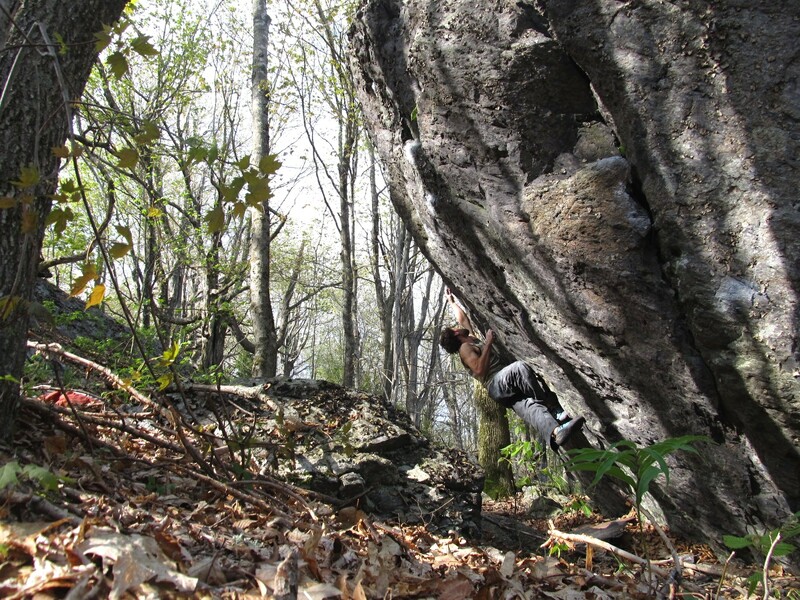 Orb Weaver (V5/6): This problem was a lot of fun to discover and climb. It has a little of everything. The problem starts on the right side of the main steep face. Sit start at the good one-handed jug chunk (right hand), and with a left hand below the jug, pinching the angular, left facing, smooth side-pull. Make a huge move to deadpoint the deep three finger pocket. I thought this move would prove easier, but I was wrong! Following the deadpoint pocket, work directly up the face through tricky beta and crimps to good holds and the big ledge feature. At the end you can expect to top out through beautiful jugs. 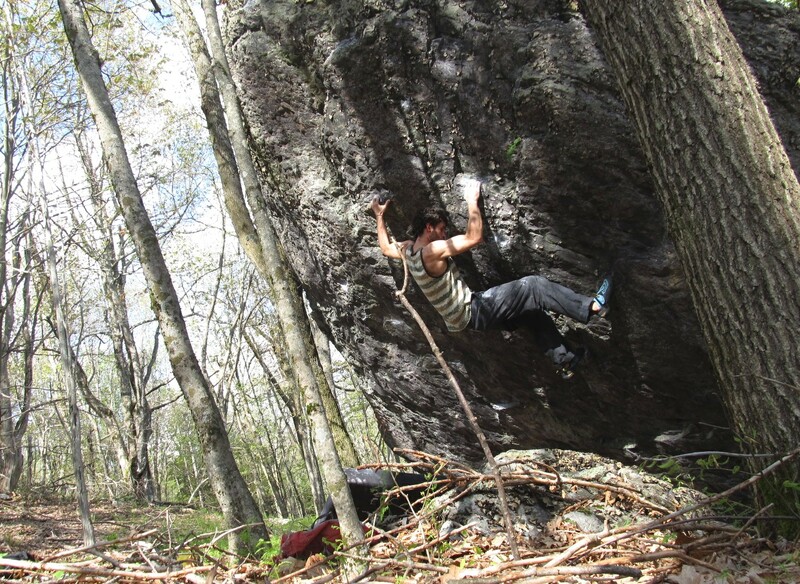 Black Widow (V7): Crimps! This problem is a crimp masters dream come true, and a crimp haters worst nightmare. The holds here are small, but not particularly harsh. The texture is smoother than most of GHSP. Black Widow is to the left of the back main steep face. Start low-ish with your right hand in the interesting, deep, right facing, dark colored jug. Your left hand is a slightly higher crimp. Post a high right foot and blast up to the higher (right) in-cut crimp/pinch. work directly up through more crimps and nice jugs to the tallish top. The top out has really nice jugs as well… This was a summer time send, so I graded the problem expecting it to feel easier in the Fall. Directions to this boulder: Hike down to the split in the Cabin Creek Trail (~5min once you enter the rhodos from the field) and at the split in the trail, head right (don’t follow the left trail with the small “cabin creek” arrow sign). 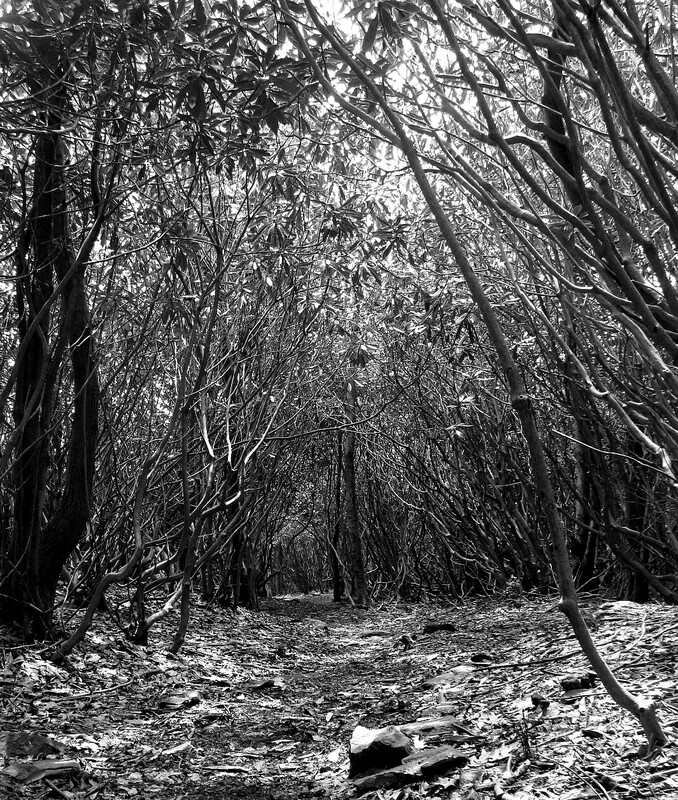 After the split, follow the trail for approximately a minute and break off of the trail, uphill, to the craggy area. There will be an old, rusting fence (to keep the wild ponies from making there way down to the waterfalls I presume) that is easy to step over near the boulder. Past the fence, look (walk) right for the big steep boulder. 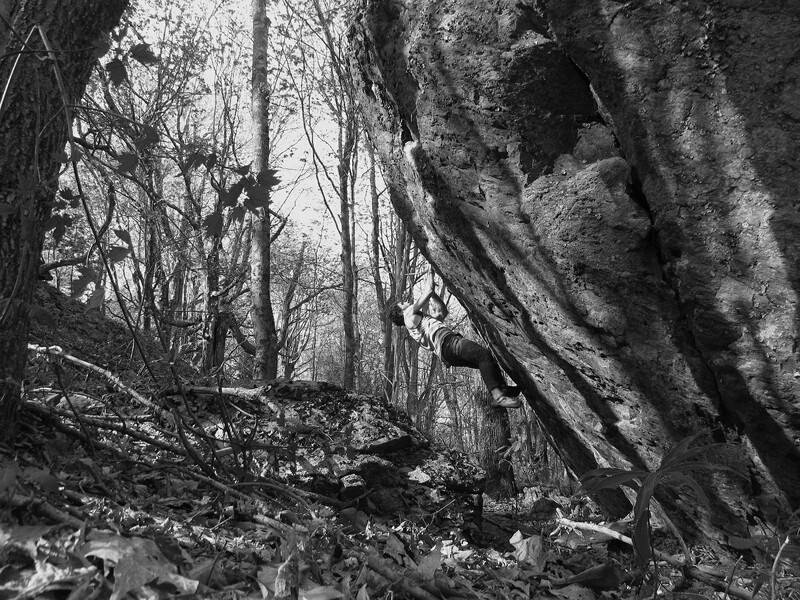 I cleaned and put up these problems in a day, and aside from searching for other boulders in the area, I haven’t returned to this block. I plan to return this Fall, but would love to hear your thoughts and see photos! I don’t spend a lot of time considering grades to new problems, so please let me know your opinions.